A couple of years ago Pete Kennedy, the MS/HS principal of UNIS Hanoi, told me he was worried about the kids. Anyone who has worked at a 1 to 1 school, where all kids above a certain age have a computer, knows something about tech controversies like this one. First it was the question of whether kids should learn technology in a computer lab or as part of their classroom subjects. Next it was how do we address the problems that arise from student tech use, such as digital distraction and cyberbullying? Then, how can teachers find the class time and develop skills to be able to develop these skills effectively? Perhaps the simplest way to put it would be: Now what? Ever since Mr. Kennedy came to me I’ve been thinking about these questions and working to develop a conceptual framework to make sense of them as well as systems and curricula to address them. This work has centered around the concepts of digital citizenship and digital literacy. 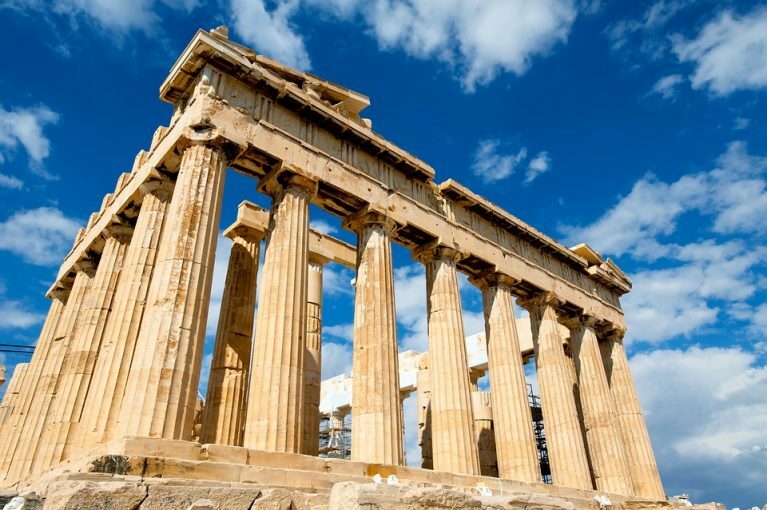 Citizenship is a concept with historical and linguistic roots in Greece and Rome. In his book Citizenship: the History of an Idea, Paul Magnette begins his account with the Greek term politeia (citizenship), derived from the terms politis (citizen) and polis (city). That is, the polis shaped the identity of those who lived in it, and politeia was associated with active engagement with the politics of the polis. In contrast, the word citizenship comes from the Latin civitas, derived from civis (citizen). It was defined by Cicero as “concilium coetusque hominum jure sociati”: the social body of citizens united by law (Smith, 1859). Because the foundation was the civis, the citizen, it was possible to conceive of citizens of Rome that lived throughout the world but were united by Roman political, legal, and social life. In modern times, we talk about citizenship as the rights and responsibilities that we have as part of a group. In democracies, this often means becoming involved with the political process and being an informed voter, obeying the laws, and treating the community with respect. digital citizenship is best understood as the ethical dimension of digital life. It is about our rights and responsibilities as we go online; not because of legal requirements or political duties, but arising from an individual and collective sense of ethical rights and responsibilities to one another. In contrast, the term digital literacy usually refers to types of skills. The word literate comes from the Latin literatus and refers to someone who knows the letters; that is, someone who has a fluency in reading and writing. However, in the past century literacy has grown as a concept to include media literacy, information literacy, and more. The concept of literacies developed further in 1996 when a group of ten scholars known as the New London Group published a “Pedagogy of Multiliteracies” in the Harvard Education Review. They argued that “the multiplicity of communications channels and increasing cultural and linguistic diversity in the world today call for a much broader view of literacy than portrayed by traditional language-based approaches.” They focused on what is now called multimodal communication, such as linguistic, visual, audio, gestural, and spatial modalities. During this time there was also an increasing focus on the way that literacy is also a social phenomenon. 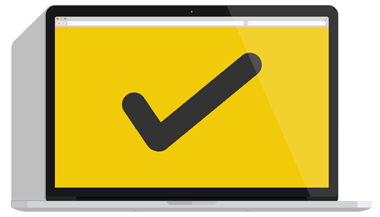 digital literacy can be understood most simply as efficient and effective use of technology. The range of verbs with which one does things with technology will vary, but the focus on skillful use (ie. efficiency and effectiveness) is consistent. While there is clearly a relationship between citizenship and literacy, both in the time of Jefferson and now, the nature of the relationship has often been obscured. Is digital literacy part of citizenship, vice versa, or are the two separate but related concepts? According to Mike Ribble of digitalcitizenship.net, there are nine themes of digital citizenship, one of which is digital literacy. This is also the framework adopted by the International Society for Technology in Education (ISTE). On the other hand, groups like Concordia University include digital citizenship as a component of technology literacy, along with communication, collaboration, research and information fluency, creativity, and innovation. In practical terms, this distinction has had real consequences for how the tech team at UNIS Hanoi thinks about our students’ digital needs. In terms of citizenship, we have taken the Common Sense Media Digital Citizenship Curriculum and begun adapting the lessons specifically for a 1:1 international school context. Most of these fit within our counseling curriculum as stand-alone lessons. Here we have specifically focused on strands that relate to ethical use: digital footprint & reputation; relationships & communication; cyberbullying & digital drama; internet safety, privacy & security; academic honesty; and self-image & identity. 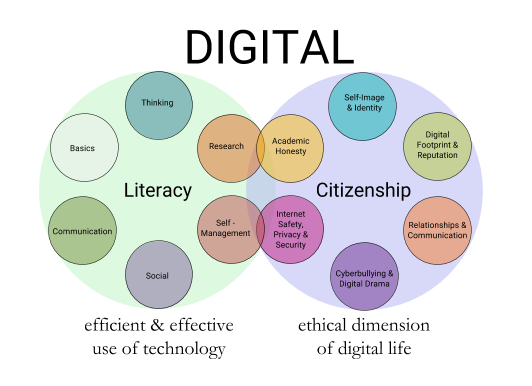 We have developed the visual below to show the relationship between digital literacy and citizenship. In my next post in this series, I will go into more detail about how these conceptual frameworks are translating into actual lessons for students. Ambach, Gordon, et al. “Presidential Committee on Information Literacy: Final Report.” www.ala.org, 10 Jan. 1989, www.ala.org/acrl/publications/whitepapers/presidential. Accessed 31 May 2017. Common Sense Media. “Our K-12 Digital Citizenship Curriculum.” Common Sense Education, 2016, www.commonsensemedia.org/sites/default/files/uploads/classroom_curriculum/cs_digitalcitizenshipcurric_2016_release.pdf. Accessed 31 May 2017. Cornell Information Technologies. “Digital Literacy is…” Cornell University Digital Literacy Resource, 2009, digitalliteracy.cornell.edu. Magnette, Paul. Citizenship: The History of an Idea. 2nd ed., European Consortium for Political Research Press, 2008. ECPR Monographs Series. The New London Group. “A Pedagogy of Multiliteracies: Designing Social Futures.” Harvard Educational Review, vol. 66, no. 1, Apr. 1996, pp. 60-93, doi:10.17763/haer.66.1.17370n67v22j160u. Accessed 31 May 2017. Ribble, Mike. “Essential elements of digital citizenship.” ISTE, 25 June 2014, www.iste.org/explore/ArticleDetail?articleid=101. Accessed 31 May 2017. —. “Nine Elements.” Digital Citizenship: Using Technology Appropriately, 2017, www.digitalcitizenship.net/Nine_Elements.html. Accessed 31 May 2017. Smith, William. A Dictionary of Greek and Roman Antiquities. Little, Brown, and Co., 1859. archive.org, Little, Brown, and Co., archive.org/details/adictionarygree05smitgoog. UNESCO International Congress on Media Education in Germany. “Grünwald Declaration on Media Education.” www.unesco.org, 1982, www.unesco.org/education/pdf/MEDIA_E.PDF. Accessed 31 May 2017. Visser, Marijke. “Digital Literacy Definition.” ALA Connect, edited by American Library Association, 14 Sept. 2012, connect.ala.org/node/181197. Accessed 31 May 2017. I am currently working as the MS/HS Technology Coordinator for the United Nations International School of Hanoi and try to help teachers use technology purposefully and creatively. My goals are to find ways to use technology to deepen learning, to engage students with authentic projects, and to bring a sense of excitement and wonder into education. 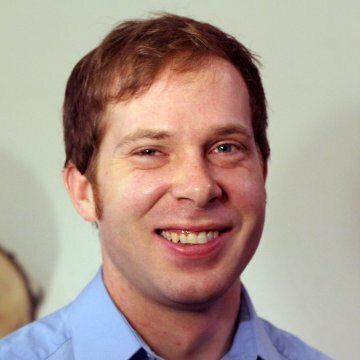 Prior to this, I worked for six years in the United States teaching history, culture, music and technology at a small high school in Indiana called Harmony School. When I’m not working, I enjoy spending time with my wife and daughter, traveling, training martial arts, and playing music.